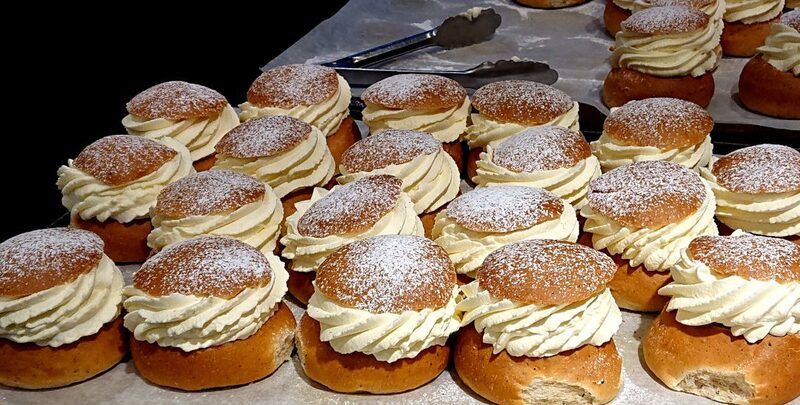 If you visit the country during the first months of the year, you will surely find yourself surrounded by nice buns filled with cream (whipped cream). It is believed that these caloric pumps have been part of the Swedish culture since at least the thirteenth century, although both its ingredients and its name have been changed. Traditionally the buns were filled with a mixture that was made with the crumb of the same bun, cream, butter and milk, and used to be eaten submerged in a hot milk dish with cinnamon. With the passage of time, already in the mid-nineteenth century, the filling has changed to marzipan (or almond mass). The last transformation occurred at the end of the First World War, led by the master pastry chef Henrik Reinhold Pettersson, who was responsible for adding a whipped cream circle to the bun, “celebrating” that this ingredient had been sold again after the war. Regarding the name, “Semla” is the most used in our days, and its translation could be something like “well sifted flour bread”. “Hetvägg”, however, would be the oldest record in Sweden (1689) and could be translated as “Bollo submerged in milk”. Both names have been taken from the Low German. The curious thing about these buns is that in their beginnings, they were also a form of courtship very widespread in the south of Sweden. They say that during the festivities of the Confraternities of Lent, the peons used to give to the servants these buns and that, those who received them, they had to correspond with some eggs during Holy Week. Apparently, this exchange involved numerous times a commitment to marriage. Today, the Semla has ceased to be an object of flirting and has become one of the favorite buns at the time of the FIKA. You do not believe me? Come and discover the city with our FRE TOURS STOCKHOLM in ENGLISH, and let the guide show you where to buy the best Semla in Stockholm.